All Waitrose eggs carry the Lion Mark which shows that they have been produced to higher standards than required by law. Every egg can be traced back to the parent flock and is stamped with a 21-day best-before date. Pat the potatoes dry with kitchen paper. Mix 2 tsp of the oil and the crushed chillies, pour over the potatoes and set to one side. 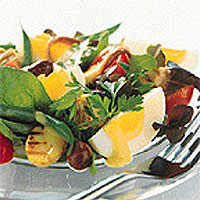 Make the dressing by mixing the mustard, sugar and vinegar together and gradually whisk in 3 tbsp of the oil until thick. Pour the remaining oil over the tuna steaks and season well. Place the tomatoes, beans, anchovies, olives and salad leaves in a bowl. Heat a ridged griddle pan over a high heat. Place the potatoes in the pan cut side down, for 3 minutes or until charred stripes appear, turn and cook for another minute. Transfer to a small bowl and mix with 1 tbsp of dressing. Reheat the griddle pan over a high heat and cook the tuna steaks for 3 minutes on each side or until cooked. Transfer to a plate and pour over 1 tbsp of dressing. Break the tuna into bite-sized chunks. Add the remaining dressing to the salad and mix well. Place the tuna and potatoes on the salad and gently fold in. Arrange the eggs on top and serve straight away.